A group of Port Augusta Secondary School students now have the skills and knowledge required to responsibly sell or serve alcohol. Six PASS students, including three from the YES Centre, successfully completed a Responsible Service of Alcohol (RSA) course on October 23. The eight-hour course was run by Career Employment Group and was held at Central Augusta Football Club. The training included a combination of theory and practical exercises that students had to successfully demonstrate to gain competency. This unit covered the performance outcomes, skills and knowledge required to responsibly sell or serve alcohol. On completion of the course students were issued with a nationally accredited statement of attainment for Provide Responsible Service of Alcohol. 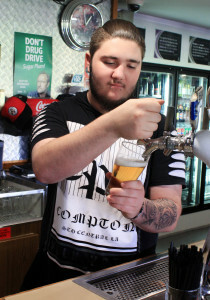 A student who completed the training, Munro, said what he found most beneficial about the course was learning about standard drinks and alcohol percentages. “The best thing about the course was learning about standard drinks and how that differs,” he said. Mia also said she was surprised by the difference in beverages and the standard drink sizes for each. She said because she completed the RSA course it has helped with her gaining employment at Stirling North hotel. Eboney said one of the things she wasn’t aware of before doing the course was the legal responsibilities of bar staff when serving alcohol and how important that is. She said she wasn’t aware of the extent of the liabilities involved. Responsible practices must be undertaken wherever alcohol is sold or served, including where alcohol samples are served during on-site product tastings. The training undertaken by the students can be applied to all levels of sales personnel involved in the sale, service and promotional service of alcohol in licensed premises. Those selling or serving alcohol may include food and beverage attendants; packaged liquor sales persons selling in person, over the phone or online; winery, brewery and distillery cellar door staff; and supplier sales representatives.